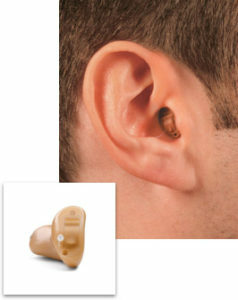 Hearing aid styles range from practically invisible to those that wrap around the outside of the ear. There are six main styles, each of which comes with its own set of advantages and disadvantages. Your Arizona hearing specialists will work with you to discuss each option to determine what works best for your type and severity of hearing loss as well as your cosmetic preference. The microphone picks up sounds from the environment and translates those into an electrical signal; that signal is sent to the amplifier. The amplifier increases the volume and sends this newly altered signal to the receiver. The receiver (also known as the speaker) converts the electrical signal back into sound where it travels through the ear and is sent to the brain. While all hearing aids may have the same basic parts, their shape, size and performance all differ. The invisible-in-the-canal (IIC) model is the smallest device currently available. 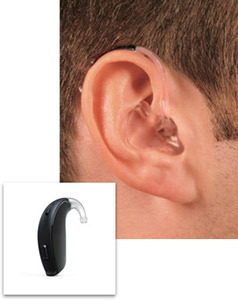 The entire hearing aid sits inside the ear canal, making it practically invisible. Since this model is so small, it cannot fit any additional features and also takes the smallest batteries. The smaller the battery, the quicker they drain. Since this device sits so deep inside the ear, it is less likely to pick up background noise, such as wind, but is prone to earwax blockage. This model can treat mild to moderate hearing loss. The completely-in-the-canal (CIC) model fits entirely inside the ear canal, making it almost invisible. The small size means there are very few additional features and the device requires a small battery with a short battery life. This model can treat mild to moderate hearing loss. 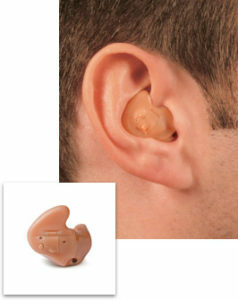 The in-the-ear (ITE) model comes in two versions; one that fills only the lower part of the outer ear (half shell) and one that fills most of the outer ear (full shell). Since this model is even larger than the last few, it can contain significantly more features and a larger battery. This device is more visible than the others and picks up more background noise, like wind. This model is appropriate for mild to severe hearing loss. The receiver-in-canal (RIC) and open fit models have two parts connected with a thin wire. The portion that sits in the ear canal is small, meaning the ear canal is not fully blocked. This enables low-frequency sounds to enter the ear naturally; high-frequency sounds are still amplified through the hearing aid. These models are appropriate for high-frequency mild to moderate hearing loss. The behind-the-ear (BTE) model consists of two parts, one that fits inside the ear canal and one that hooks behind the ear. This is the largest and most powerful of all the devices. The BTE can fit the most additional features and uses the largest battery. 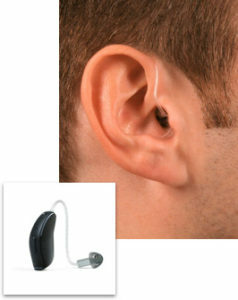 This device is appropriate for almost all types of hearing loss.